As in previous times of transnational public upheavals such as 1968 and 1989, artistic advocates of freedom, from circa 2011 onward, have taken their ideas into full public view. One can point to the prominent role artists played in the revolts that shook the Arab world, as much as in the creative milieu of the Indignados/15M movement in Spain, and the global phenomena of Occupy. Dissenting artistic agents of change have sparked public debate in countries as far apart as China, the US and Europe. Russian contemporary art, too, has figured prominently. This presentation takes a historical and comparative look at these synchronicities and their structural parallels. Firstly, it discusses the historical inversion of ideological markers in the post-Soviet period, which has enabled a global, largely unspoken re-alignment between anti-authoritarian intellectuals. 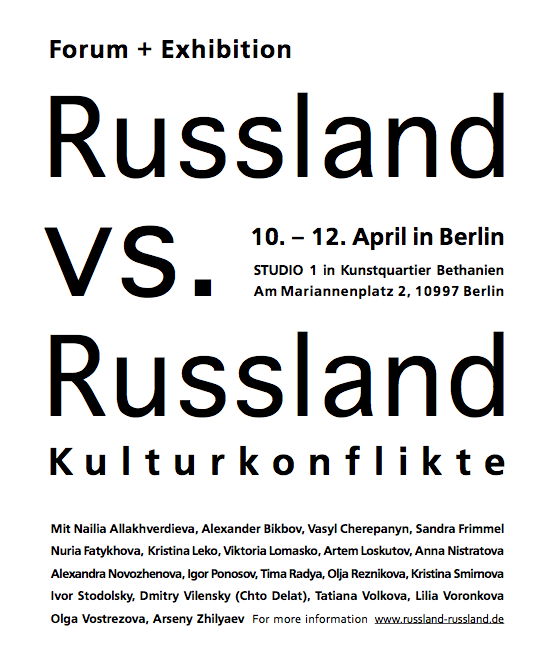 Secondly, it outlines a series of structural parallels between diverse socio-political and cultural contexts, drawing on examples of politicized artists and their work under repressive regimes in Russia, Egypt, Palestine, China and Europe, encountered in the Re-Aligned Project (www.re-aligned.net). If time allows, we will also readdress the issues of the writing of history and the canon and discuss the question of universality with regard to the plural narratives of our time.